For the love of Story | Damian Trasler's Secret Blog - Do Not Read! GlaDos is awake…and she’s not happy. Games and stories have been linked for a long time. Even with the advent of video games, people wanted to know the story. The frog has to get across the road, huh? Seems legit. Tell me again, the plumber is trying to rescue who? Oh, ok, and where do the turtles come into it? With improvements in graphics, some games have sold themselves as “cinematic”, the implication being that you’re not playing a game, controlling a movie. It’s a story that you control. Some companies have started employing writers to work on the (often cheesy) in game dialogue to make it more realistic, or improve the plotlines to make the games more interesting. It’s a challenge, because if that’s the kind of game they’re developing, they don’t want the writer to come up with a traditional story. They want a multi-strand piece, a story that divides again and again as the main character makes different choices. It’s like writing a dozen versions of the same novel, getting to explore all those “What-ifs” instead of picking the one that’s most dramatic and satisfying. This has been on my mind of late because I bought “Portal 2“. I’d not played the original, but I had a pretty good idea of what it entailed. I was looking forward to grappling with the complex puzzles and thought it might be fun for the Weasels to get to grips with too. But I thought I would be playing it in slow time – working out a room here and there, coming back to it from time to time because, hey, it’s a problem solving game, right? I hadn’t counted on the story element. 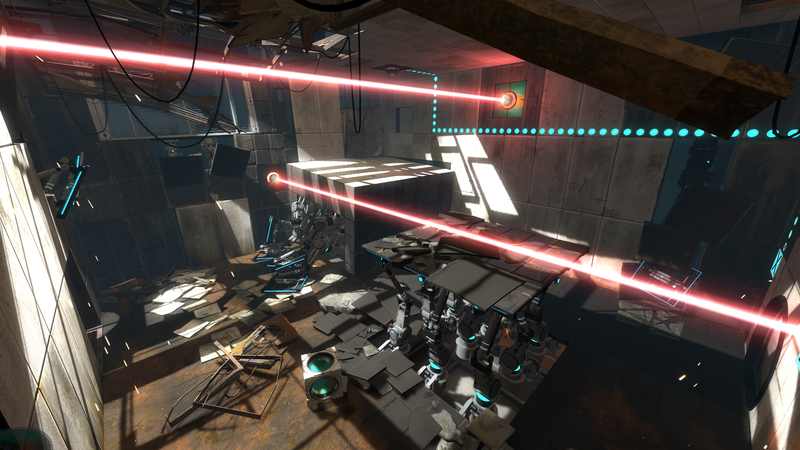 A test chamber with deadly lasers…Watch your step! In the game, you’re the same test subject as in the first game, Chell, and you’ve been in hibernation for a long time. You’re woken by Wheatley, a helpful little spherical Artificial Intelligence who is trying to help you leave the Aperture Facility. Unfortunately, things are old and broken, and he needs you to work through the Testing Areas to get out. And then he accidentally reawakens GlaDOS, the psychopathic AI from the first game. She’s not happy with you, because you killed her in the previous adventure. 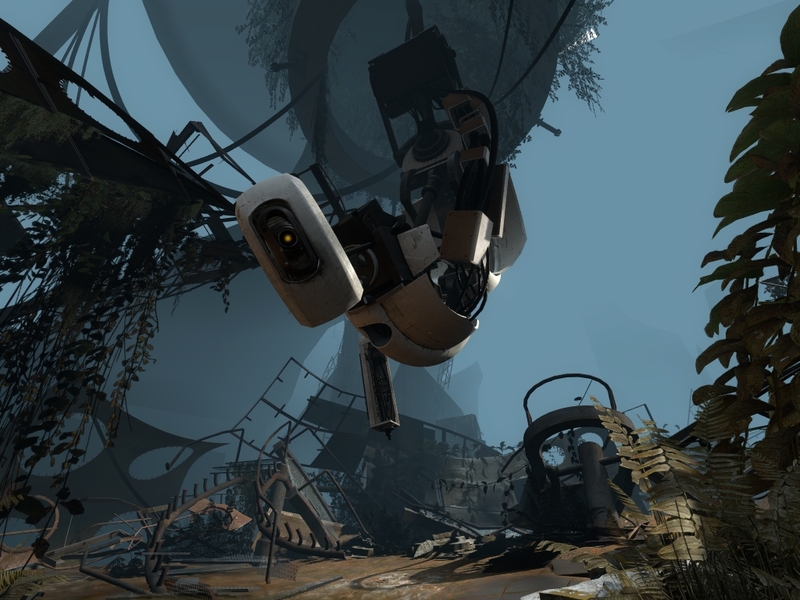 Now GlaDos is testing you and Wheatley’s trying to help you escape her AND the facility, but he’s not very bright…. There’s no chases, no gun-toting bad guys leaping out at you, but I went at those test chambers as fast as I could. Not because I wanted to escape, but because I wanted to know what happened next. I was itching to see if Chell would be allowed to leave, if she (with my help) could defeat GlaDos a second time. I won’t give away too much about the game, but there are some major twists I was not expecting that really added to the fun. I found I had played my way through the whole game in less than three days. I encouraged the Weasels to give it a go, so I could enjoy their reaction to it. Looking back, I realised that playing Portal 2 was just like playing the Tomb Raider series. Each time I went and got the new game, I imagined exploring the world of the game, testing the limits of each area and taking my time to solve the puzzles. And each time I raced through the game, eager to move on and see how the story played out. Just like with a good book, where you might read each page as fast as your eyes allow, because of the need to know what happens next. I don’t want a truly cinematic game – I have played some where the cutscenes are so frequent, my input seems unnecessary, and the game is dull. I want to influence the outcome. But although I knew Portal 2 was quite linear (there was only one solution to each puzzle, only one path through the game and only one acceptable outcome) I didn’t feel manipulated. How? Perhaps the humour, perhaps the twists of the story keeping my interest. This wasn’t a case of the environment changing but the same types of enemies leaping out to be blasted, eventually just increasing in number until the brain is numb. I had to think at every point of the game, had to plan even during the final segment where a countdown made instant decisions essential. Not a cinematic experience, not a theme-park ride. Something truly interactive, because without my input the story did not move forward, even if there was only one plotline. As a bonus, there’s a wonderful song at the end of the game, as there was with the first. The lyrics make more sense when you’ve played the game, but I have both songs on a playlist now. If you check on YouTube, you can even find recordings of the first song played by the writer, Johnathan Coulton and the lyrics sung by internet legend Felicia Day. I have that one on my playlist too. What video game stories have stayed with you beyond the end of the game? This entry was posted in Writing and tagged game dialogue, gaming, GlaDos, Portal 2, story element, video games, Wheatley, writing, writing for games. Bookmark the permalink. I’ll be sure to grab a copy – I’ve loved your real life interludes in blog form. The review will certainly follow.